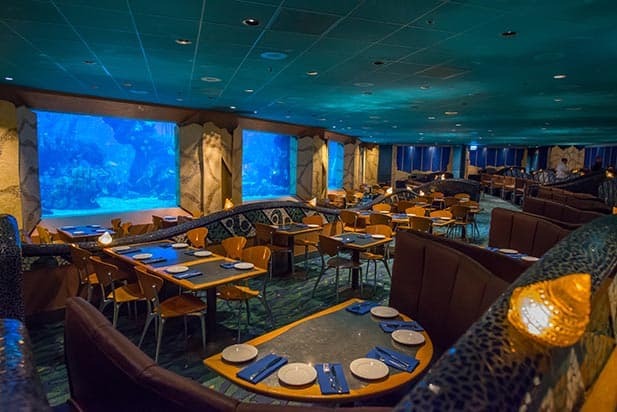 10) Coral Reef Restaurant – Guests who are looking to enjoy delicious seafood options in a totally unique full service restaurant should head to Epcot’s Future World. The Coral Reef Restaurant is located inside of The Seas with Nemo and Friends Pavilion and is open daily for lunch and dinner. Guests are seated on several levels of dining areas that all share a beautiful view of a massive floor to ceiling glass panel that looks into the pavilion’s aquarium allowing for glimpses of creatures such as fish, turtles, sting rays, sharks, and more. Those looking to get the most value of their meal at the Coral Reef Restaurant should start off with either the Jumbo Shrimp Cocktail served with traditional cocktail sauce or the Charbroiled Octopus served with Nori sushi rice, sesame slaw, and soy reduction with both options costing $14.00. The best entrée choice is the Port-Wine Braised 10-oz Beef Short Rib at $35.00 which is sow cooked for eight hours and served with creamy smoked gouda-polenta, roasted pearl onions, baby carrots, and a cabernet demi-glace. There are three desserts at the Coral Reef Restaurant that offer the best value at $9.50 and guests can choose from The Chocolate Wave with chocolate curls and raspberry cream, Turtle Cheesecake with pecan Florentine, chocolate and caramel ganache, and caramel sauce, or Warm Vanilla Custard Filled Strudel with crisp phyllo dough, seasonal fruit compote, Prosecco ice cream, praline, and butterscotch sauce. Finally, the most valuable cocktail at the dining location is the Coral ‘Rita which features Patron Anejo Tequila and Cointreau.